comes to fruition, it's better for everyone. we've tried to fit all of our cooking into that two hour period. but, sometimes: we're just tired. do nothing. and, sometimes, we let ourselves. weeks ago, into the oven before laying down. needed to be completed immediately. i stuck pretty true to the recipe. the results, i thought, were ok.
or more salt, or more spice, or something. the burning desire to make this popcorn. and, then it was monday. i had packed a couple handfuls to bring to work. when i took a bite it was completely different. the popcorn in a completely desirable way. one more must make recipe to our hectic day. end, and i'm strongly considering the addition. i did not measure the salt and i'm pretty sure that i used more than the recipe called for. i did cut down slightly on the coconut oil used to cook the kernels, and i would not advise it: i think they needed the full amount to cook properly, without getting too dark. in large pot over medium heat, toast coconut flakes and 1/4 teaspoon salt 3-5 minutes, or until fragrant and lightly golden brown, stirring occasionally. transfer to bowl. wipe pot of any remaining coconut. over medium heat, add 2 tablespoons coconut oil and popcorn kernels. shake pot to coat; cover pot and let sit. once the popcorn starts to pop, don't go too far away. wait until the popping slows to every 1-2 seconds, between pop. remove from heat and immediately transfer to bowl with coconut. meanwhile, place remaining coconut oil in small saucepot or small skillet, over medium-low heat. once warm, add mustard seeds and cooking 2 minutes, stirring occasionally, until they start to pop. pour mustard seed oil over popcorn. add remaining salt and chili powder; toss immediately to coat all the popped corn and to incorporate the coconut. 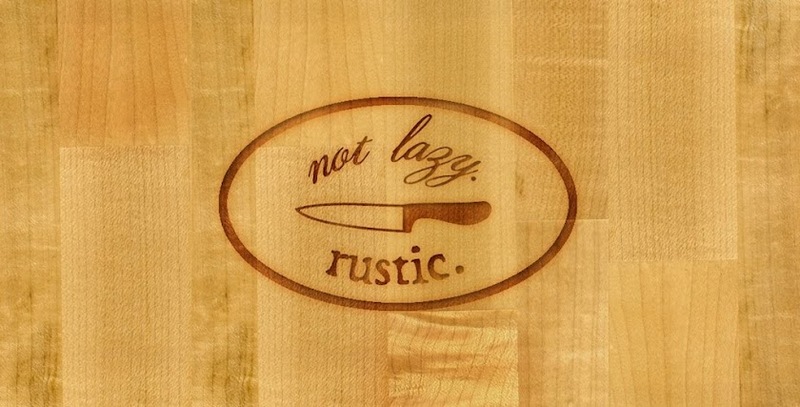 if you can hold out until the next day, wait to eat then. it's been almost two years since this blog went silent, which not so coincidentally, is almost two years since I found out everything was changing. that's almost two years since i suddenly could only stomach pasta with butter, plain slices of bread and tortillas topped with melted cheese. it's almost two years since i started hating the smell and taste of vegetables and began an intense love affair with all things fruit. it's been just over 15 months since i no longer was so interested in eating and worried that i'd never figure out how to possibly cook again with this new responsibility. and, it's been just two weeks short of a year since i went back to work (with homemade cookies in hand!). have i been cooking? yes. has it been good? decently. but, cooking is now done in large batches, over the weekend, freezing teeny portions into ice cube trays, and larger portions in containers to make sure that we eat decently - without falling dependent on takeout - throughout the week. taking pictures seems silly and wasteful, while we're trying to finish as much as we can before our very active baby wakes up from her nap. but - i've missed this space, this recipe diary. and, i'm determined to come back, in some way. 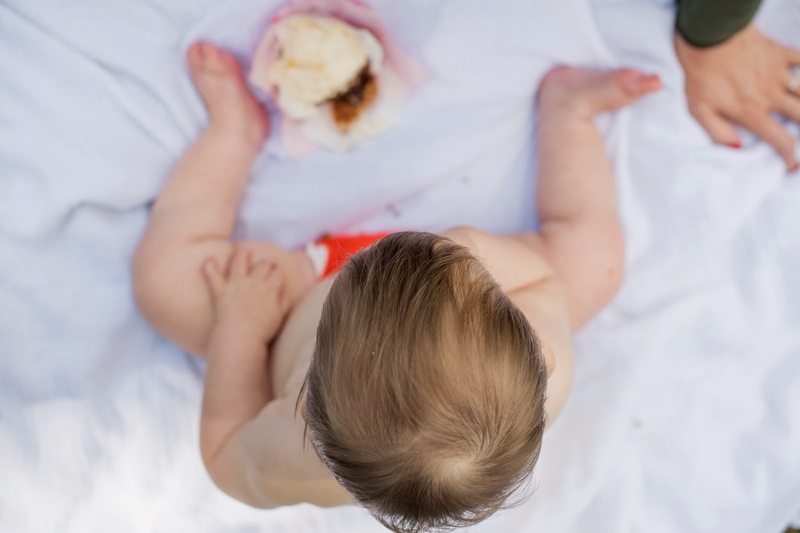 when i started to cook today, while the baby was in my arms and i was placing tiny fingerling sweet potatoes into a large pot, i thought, i should blog this. and because i haven't thought that in a very long time, I went with it. so, here we are. i'm not focusing on the fact that i'm writing in my car, on my phone, letting a very overtired baby finish her nap or that the pictures were taken with the very same phone and not my camera. and, maybe while i was trying to clean cilantro, to make this potato salad, this happened. last week, i picked up those adorable potatoes. and then, i ignored them. lest losing them the way too many pieces of produce have gone in the past, i woke up knowing they needed to be cooked before i let myself get back into bed. i'm in the midst of a sweet potato-miso-scallion obsession, so the plan was easy. once the potatoes were in the pot, i sprinkled them with a bit of salt and covered the lot with a couple inches of cold water. the lid went on, i brought the water to a boil and, then, let them cook for 5 minutes. when they were drained and cool enough to handle, i halved them lengthwise, placed them cut side-down on a very lightly oiled sheet pan. they roasted about 10 minutes, until they were tender and the skin started to pucker. meanwhile, i stirred together big scoops of tahini and white miso (about 1/4 cup of each), a decent splash of sesame oil, 4 spoonfuls warm water, a small palm-full of toasted sesame seeds and two quick shakes cayenne. into the bowl, i added 2 small bunches scallions that were cleaned, trimmed and sliced and a medium handful of that cleaned and chopped cilantro (stems and all). i did not stir. when the potatoes came out of the oven, i gave the pan a shake, dumped them into the bowl and let the whole thing sit for a few minutes before gently tossing together. and then, i scooped a few into a small bowl, took a picture and gave one to the baby, who quickly ate two more, and threw none of it on the floor. 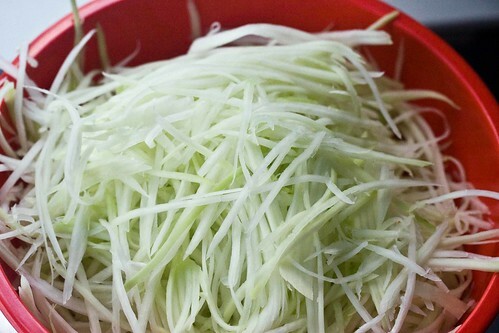 without ordering a green papaya salad. once the meal is over. i want it to be spicy. bright with fish sauce and lime. add texture and break up the spiciness. that i just can't put my finger on. so, i was always little afraid to make one at home. ok, that's not entirely truthful. 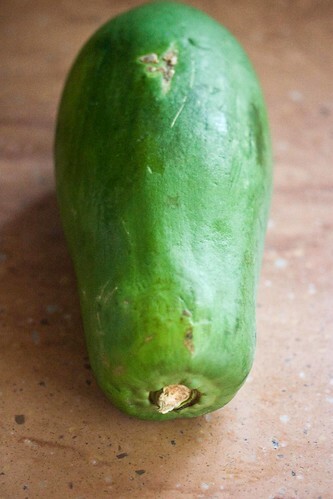 but finding green papaya is not so easy. salad as a restaurant-only treat. and then, lo and behold. i didn't think it was big enough. started stacking up in the bowl. we had more than enough. and gave it a taste. it sort of tasted like green papaya salad. a third serrano went in. more fish sauce. it was good. it really was. but was i jumping out of my seat excited? would i make it again? yes. several thai restaurants we've visited. 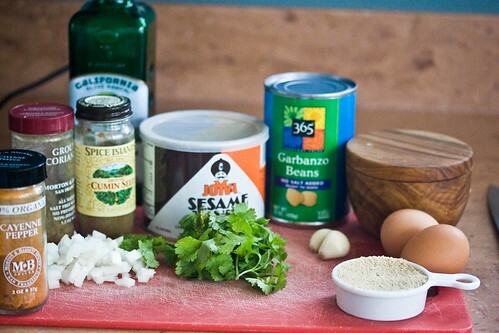 i often find that i add more garlic, more fish sauce, more, more, more of everything with flavor than a recipe calls for. i don't know what it says about me. regardless. when tasting this salad for the first time, i wished three things: that i had let the mixture marinate for a bit before serving, that i chopped extra dried shrimp and garlic from the beginning and that my serrano had typical serrano-level spice. below, i've written the recipe with my changes and the way we made it, but keep in mind that the original had cilantro and scallions. again, this was not exactly the original. i learned through this experience that a) larry did not know that there was a difference between cherry tomatoes and grape tomatoes and b) larry cleans the fridge out much more than i realized. hence, this recipe was prepared without cilantro or scallions. we also used cashews instead of peanuts, because i love cashews and that was what was in the house. a couple more things: i brought leftovers for lunch and they were great, so don't be afraid to let this sit overnight. the original recipe was six appetizer servings, but for us, it was three decent size main meals. bring medium saucepan of salted water to a boil. in small bowl, whisk together lime juice, brown sugar, fish sauce, shrimp, garlic and shallot. taste and adjust flavor, if desired. set aside. 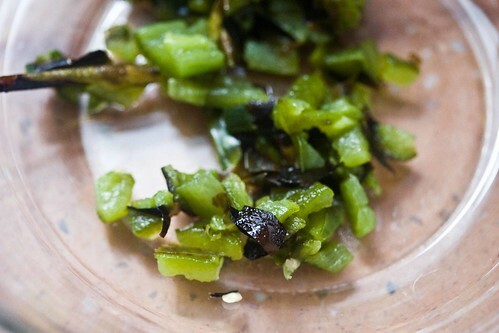 add green beans to boiling water; cook 2-3 minutes, or until just crisp-tender. drain; rinse under cold water to stop cooking. cut into 2-inch pieces. 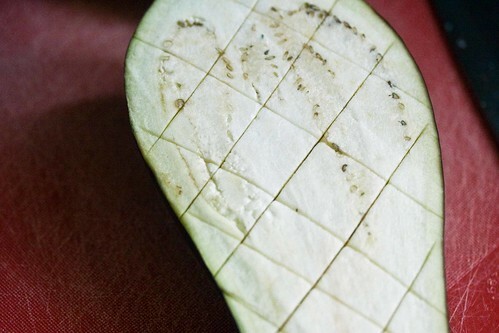 using julienne peeler or box grater, shred papaya. measure 6 cups papaya. place papaya in large bowl. 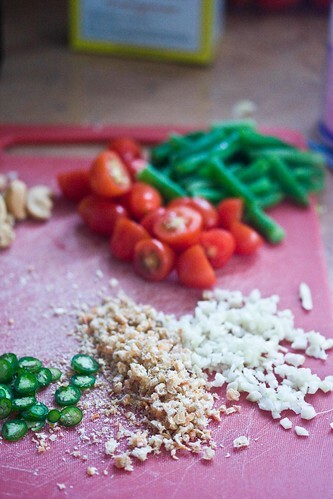 add green beans, tomatoes and chile pepper. top with dressing; toss to combine. let sit. 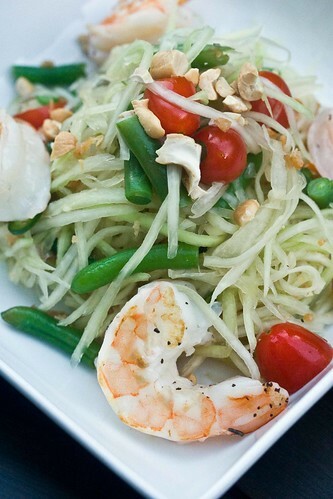 when ready to serve, divide papaya salad among serving plates. season shrimp with hot and pepper. heat grill pan or saute pan over medium-high heat. grill shrimp 4 minutes, or until just firm and cooked through, turning once midway through. 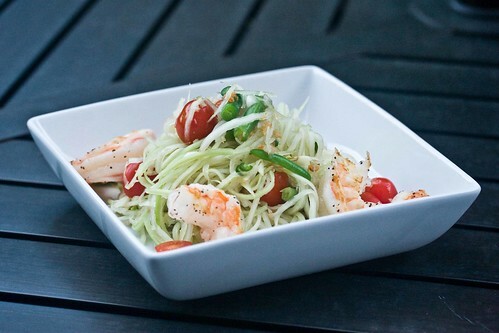 top salads with shrimp. sprinkle with cashews. ...would choose whisky over wine. ...was the life of the party. ...takes life as it comes. ...loves action and science fiction movies. didn't make it past the 10 yard line? there are some things that you can't make happen. i can influence. like cocktails. 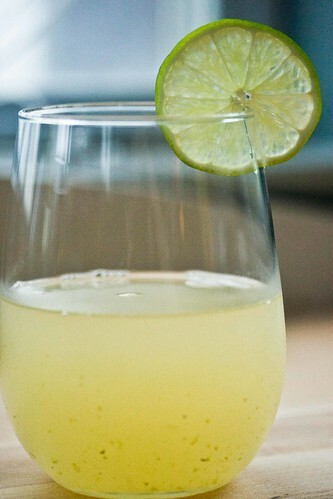 a gin gimlet that's heavy on the lime. a big drinker anyway, it's hard to readjust. in the july issue of bon appetit. asbury park, larry ordered a jalapeno margarita. i had a sip, which burned my whole mouth. reached in for another sip. my mouth was on fire. which was what this recipe called for. but brown and crispy on the top. scolded myself for being a chicken. so spicy that i was miserable? plus a bit of agave. with some ice cubes and waited. dissolve as instructed in the recipe. and came back up with a bottle of bourbon. more specifically, where he went wrong. your cocktail is not, i told him. the ice cubes still have to melt. back in the basement and started making dinner. garnished it with lime and took a sip. i had made a spicy margarita. how had i not realized this before? and it was nice and different and fine. jalapeno tequila sitting in the fridge. i wasn't ready to give up on it. and think that maybe that was the answer. half mad scientist on a mission. whole glass with the tonic. i set out to recreate. that i had made a week before. for one and decided to just, be. the one thing i really have to say about this is that, obviously, if your jalapenos aren't spicy, your tequila will not be spicy. it's the luck of the draw. 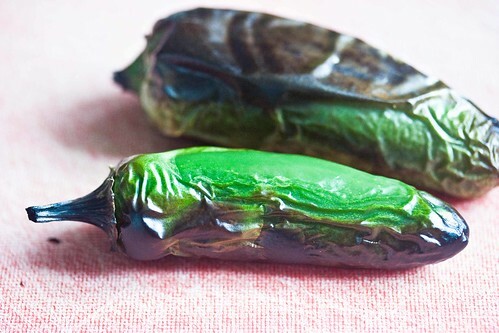 but, i would taste the roasted jalapeno before adding it the tequila. if it's not spicy, i would hold off on making it. heat broiler, grill or the flame on your stove top. 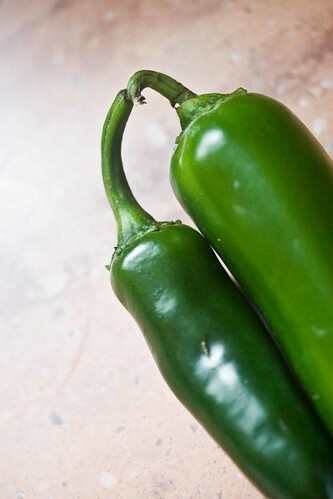 place jalapeno on grill, on broiler pan or on flame and cook 3-6 minutes, or until jalapenos are soft and blistered, turning often. when cool enough to handle, seed jalapenos, if desired. chop jalapenos. 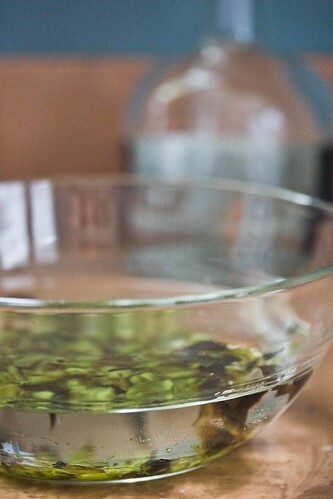 transfer jalapenos and seeds (if using) to a glass bowl or jar with tequila. stir to combine. let sit 1 hour. 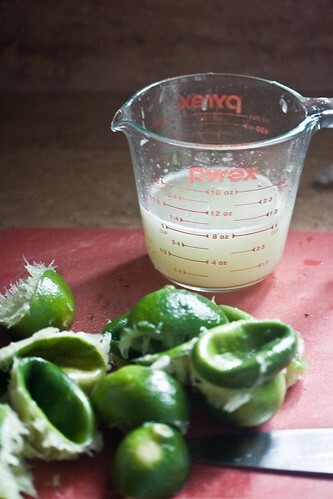 strain tequila into a sieve set over a pitcher, pressing on solids to release extra liquid. discard solids. at this point in my life, i'm using diet tonic water. if that makes you sad, go with regular tonic. 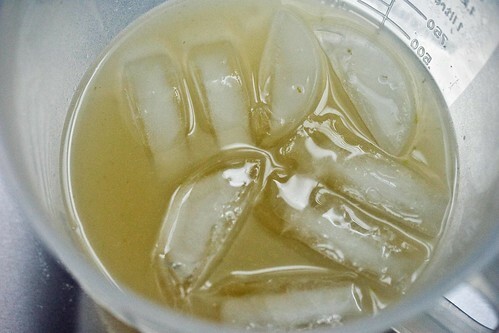 in large glass, stir together agave, lime juice and tequila. 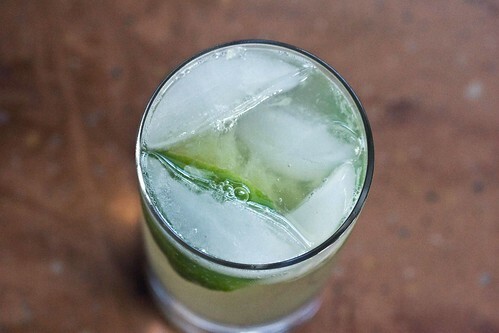 add ice cubes and squeezed lime. 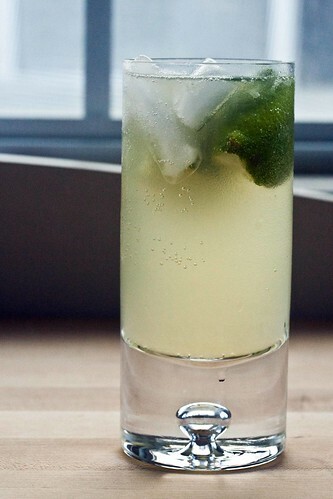 top with 1/2 cup tonic water. stir gently, just to combine. taste and add up to 1/4 cup more tonic water, if desired. the one change i made to this recipe was to reduce the agave from 1/2 cup to 2 tablespoons. i'm sure it would have been tastier with more, but i didn't miss the extra sweetness. in pitcher, stir together all ingredients. let stand until ice cubes have melted, stirring occasionally. 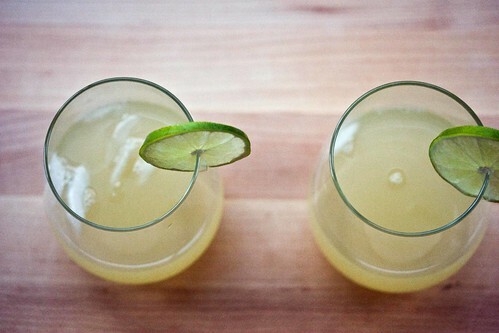 divide gimlet among 4 to 8 glasses, depending on your crowd. something that's really special to eat. so that broccoli? it's roasted. if you read this blog that i'm not too into chicken. that we might actually look forward to eating. and for the most part, it's worked. our dinners have started to seriously resemble each other. grilled shrimp and fill-in-the-blank with whatever's in the fridge. 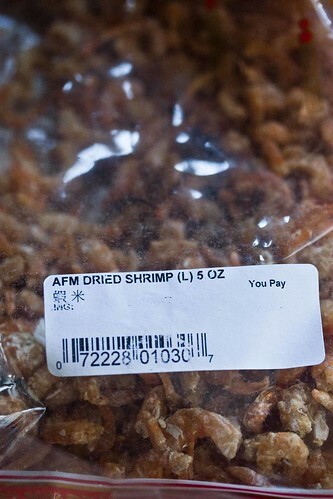 there have been a lot of shrimp. shrimp is a good compromise. for new inspiration and the magazines for new recipes. and created with an end result in mind. i won't lie - there are a lot of ingredients. like the vegetables that i wanted to be fresh. the cucumbers and the cilantro. 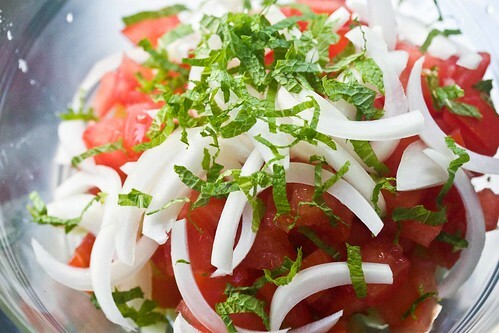 and prepare a tomato salad. in just over an hour, if you're strategic. need proof? see: name of blog. makes people feel like they're eating real food. and, around here these days, that's important. i made a couple of changes to the recipe based on both, ingredients that i had on hand and a few small mistakes that i made. i used vidalia onions instead of red in both places, because i had one sitting on my counter. i replaced the fresh breadcrumbs with whole wheat panko. i could have sworn that the recipe called for cilantro, so i bought a bunch. i used the herb to replace the parsley in the chickpea mixture. for the relish, i used mint instead of the parsley, increased the cucumber and tomato, and eliminated the olive oil. and, i replaced the honey in the tahini sauce with agave. when i made this, i decided to deal with roasting the eggplant, then i set out in a mad dash to get everything else done. this worked for me, by the skin of my teeth, but if you're looking for more of a relaxed cooking experience, make the tahini sauce first and make sure to prep the relish ingredients before starting everything else. lastly. while i was perfectly content eating one-fourth of the leftovers the next day for lunch, i felt like the night before at dinner, i definitely should have planned to serve it alongside something else, like a salad. 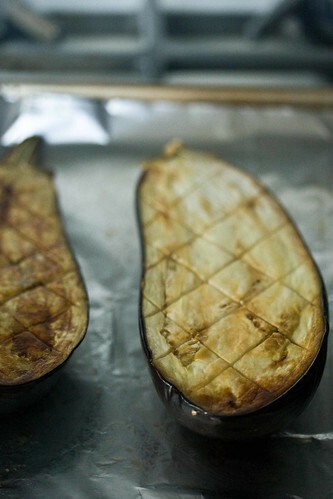 halve eggplants lengthwise; score cut sides of in crosshatch pattern. 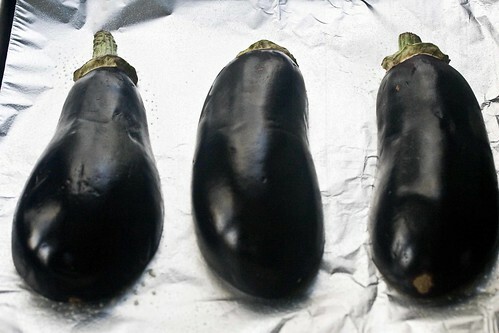 place eggplant halves, cut side down, on aluminum foil-lined baking sheet coated with cooking spray. bake 7 minutes, or until slightly tender and browned. carefully scoop out pulp, leaving a 3/4-inch shell (reserve pulp for another use). 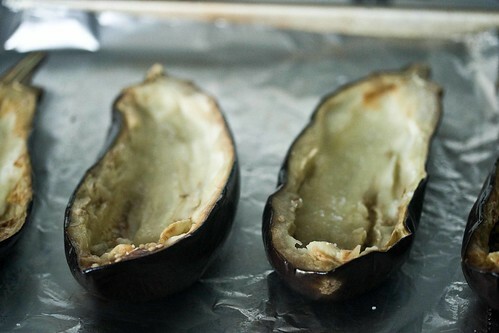 season eggplant with 1/4 teaspoon salt. meanwhile, in bowl of food processor, combine chickpeas, eggs, garlic, onion, breadcrumbs, cilantro, tahini, olive oil, cumin, coriander, black pepper, cayenne pepper and remaining 1/2 teaspoon salt. process 1 minute, or until smooth, scraping down sides of bowl, if necessary. 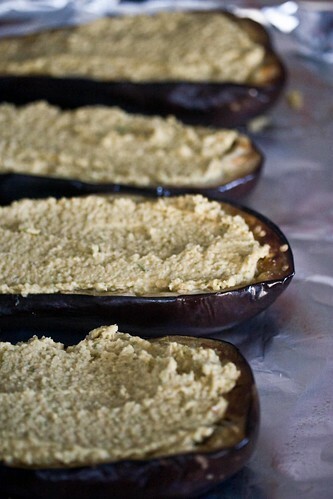 fill each eggplant with 1/2 cup chickpea mixture, spreading smooth. 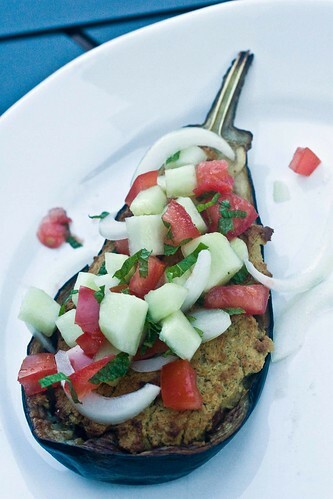 bake 25 minutes, or until eggplant is tender and chickpea mixture is lightly browned and puffed. 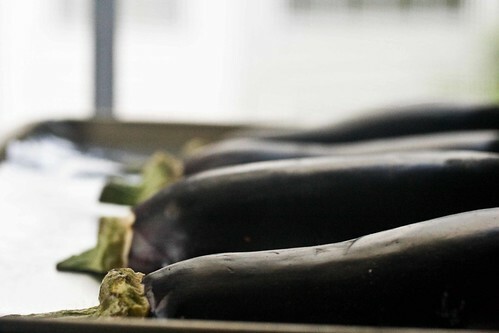 place eggplant on plates. 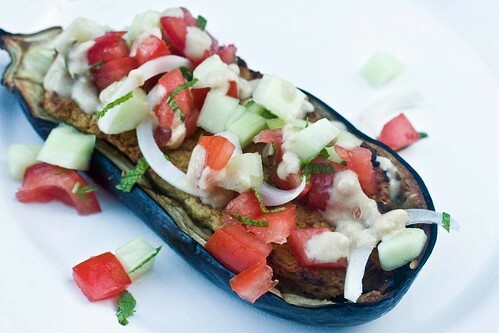 top each eggplant half with a heaping 1/3 cup relish and 1 1/2 tablespoons tahini sauce. in bowl, combine all ingredients. 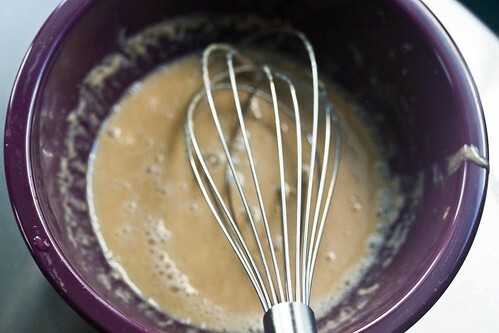 in bowl, whisk together all ingredients.